We are very glad that Tara Joy’s eco adventure children’s book ‘The Inner Sense of Trees’ has now been created into a beautiful little video and that it is FREE and easily available for people to watch all around the world. This little video is thought provoking and optimistic and is a great watch for the whole family. 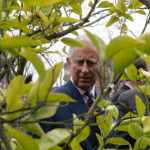 In 2016 Active Remedy Co- Founder Tara Joy released her eco children’s book ‘The Inner Sense of Trees’ and since then it has been loved and enjoyed by many adults and children alike including by HRH Prince Charles. The fact that it is now also available as a free video is a real step forwards because the message that it carries is one that should not be exclusively for those that can buy a copy of the book. 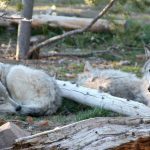 It is important that it can have a much broader reach because it carries some very pertinent messages about why it is so essential to respect nature, conserve ecosystems and work together. Also, although it carries a strong warning of the hazards that occur along with environmental degradation, it also has an optimistic message that can inspire greater enthusiasm and care for nature. This video has been made using very simple effects but this simplicity has its own charm and hopefully it is the first of many video and theatrical renditions of ‘The Inner Sense of Trees’. Tara Joy wrote and illustrated it inspired by her years of working for ecosystem conservation and preservation. 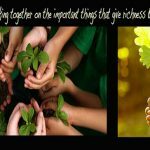 In today’s world, good environmental education for the youth is so essential because it is the lack of such education and awareness about the interrelated nature of Earths’ ecological systems, that is responsible for so many of the social and environmental crisis that we are all currently facing. Thus it is important that there are more books and videos available that encourage young people to respect and preserve nature. This is a book and video that the whole family can enjoy. The Inner Sense of Trees is a brightly illustrated epic adventure designed to inspire the reader to consider the true importance of nature. It is set on a little planet that is not so very dissimilar from Earth, although it looks quite different. Upon this planet everything – from the mountains and rivers to the trees and clouds – is alive and full of personality. The Igglings and Bigglings inhabit this world and they are at the heart of this story. They once respected and took care of each other, and were the caretakers of nature. Yet in this story something happens, and the Bigglings become greedy, forget the importance of trees and almost destroy every last one. While all of this is happening the Igglings hide away and go to sleep and only get involved when everything is all but lost. The situation seems irreversible and doomed. Fortunately however, they have the help of two wise old trees that are in fact the last trees standing. These trees unite the Igglings and the Bigglings, who put aside their differences and work together to save their little world. This is not a story of goodies and baddies – it is story of forgetting and remembering. This inspirational story highlights the importance of trees, rivers, mountains and working together for the common good. The illustrations are so bright, humorous and detailed that they tell a part of the story that words alone could not convey. There is a little character that is the storyteller who appears in every picture. Finding this character can be a source of much enjoyment. Also there are pages for colouring in and drawing at the back of the book. Profits from the sale of “The Inner Sense Of Trees” go to support the work of Active Remedy Ltd, a UK based environmental NGO, towards safeguarding the global water cycle and the ecosystems which maintain it.